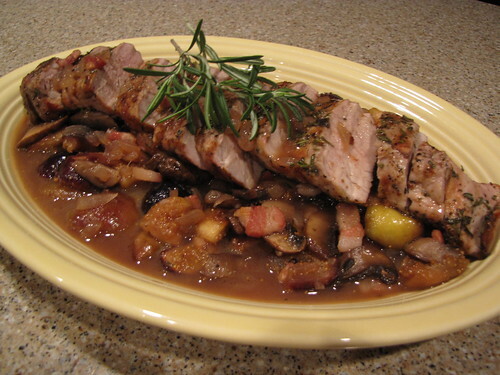 Fig & Rosemary Pork Tenderloin. Good food. Really good food. But first, a quick story…. A couple of weeks ago, shortly after the first anniversary of Idiot’s Kitchen, my husband Jim and I were chatting over dinner and a glass or two of wine about new ideas for the website. In what can only be seen as an indication that I make him watch WAY too much food television (don’t worry, football season starts this week), he suggested that we adopt a Secret Ingredient for Idiot’s Kitchen like they have on Iron Chef and make several recipes featuring that ingredient. So this week I decided to make the first Idiot’s Kitchen Secret Ingredient FIGS. Jim was perplexed. “Figs? Seriously?” I think he was hoping for the secret ingredient to be beer or bacon. So I did a quick poll of a few of you over at our Facebook page and people seemed fairly game about trying some fig dishes. A few of you even had great suggestions. But I know some of you will still need a bit of convincing. 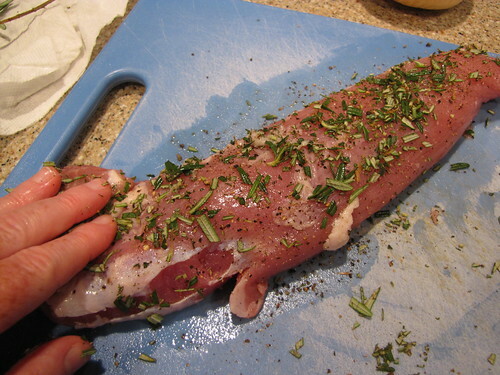 So I present to you Fig & Rosemary Pork Tenderloin. 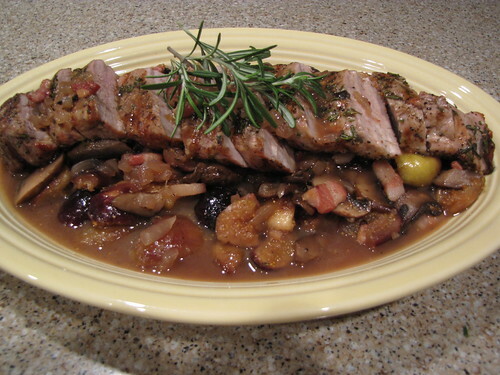 Delicious grilled Pork Tenderloin marinated in rosemary and served with a sauce of figs, pancetta, and crimini mushrooms. This sauce….there are just no words. So good. Trust me on this one and join our figgy adventure. Pork Tenderloin, Pancetta, Rosemary, Figs, Onion, Baby Portabella Mushrooms (also called Criminis), Marsala Wine, Chicken Broth, Olive Oil, Butter (not pictured), Salt & Pepper. For those of you only familiar with figs in their dried or cookie form, fresh figs are little bulb shaped fruits. 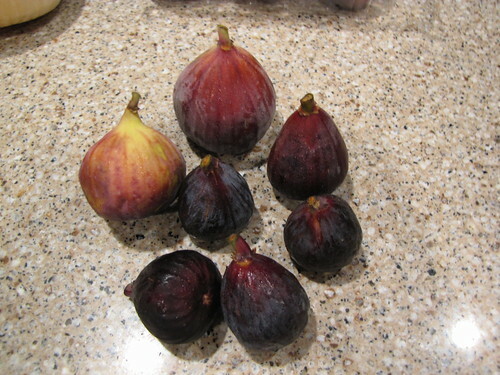 The smaller dark figs are Mission Figs and the bigger reddish yellow ones are Turkish Brown Figs. Either variety will be great in this recipe. 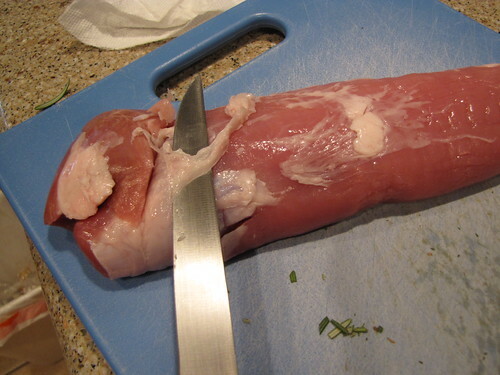 For the pork tenderloin, depending on how much your butcher or store pre-trims their meat, you might need to do just a little trimming. Mine is already pretty well trimmed but on some pork tenderloins you will notice a thin, grayish layer of “skin” on top of the meat. This is called Silver skin and you want to trim it away because it gets tough and inedible once the pork cooks. Simply use a sharp knife and carefully trim away any of this silvery colored skin from the tenderloin. 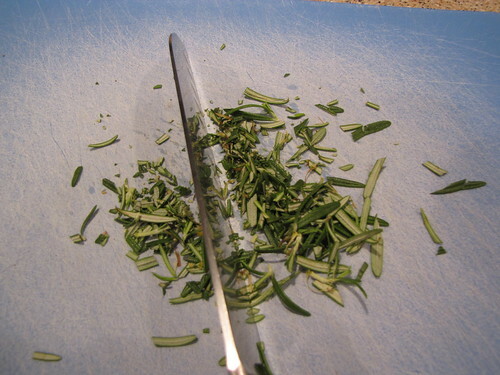 To season the pork, remove the little leaves from a few stems of fresh rosemary and give it a chop. You’ll need at least 1 Tablespoon of Chopped Rosemary – about 3 sprigs. 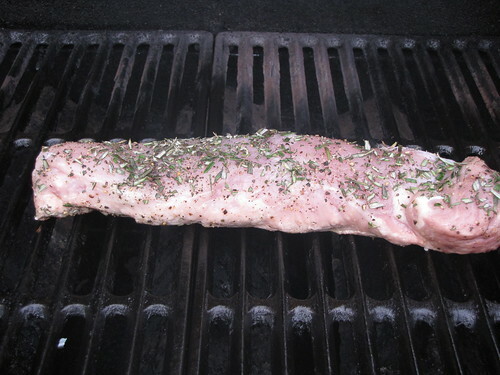 Drizzle a thin coat of Olive Oil over the pork and rub it into the meat. Season the pork with Salt & Pepper and then rub the fresh chopped rosemary all over the tenderloin pressing lightly to get it to stick to the meat. Let the meat rest to come up to room temperature and marinate in the olive oil and rosemary while you preheat the broiler or grill. 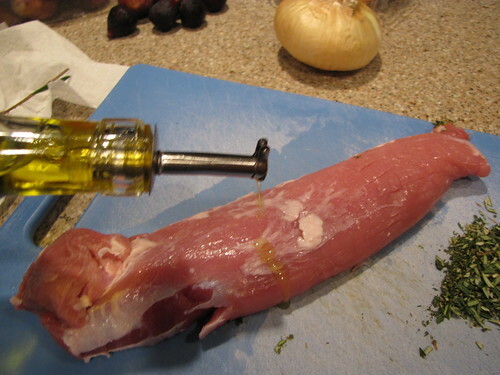 Remember that you, your knife, and your cutting board all have raw pork cooties. Wash up and get a clean knife and board to chop the other ingredients. 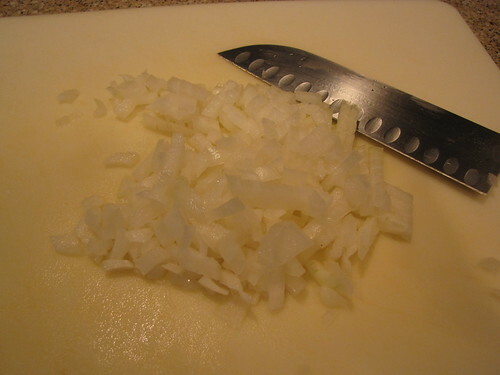 The original recipe called for shallots but I didn’t have any so I chopped up 1/2 an onion. 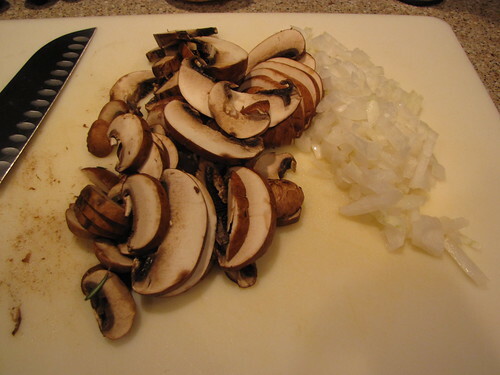 Rinse and pat dry (or brush off) 8 ounces of baby portabella mushrooms and slice them up. These are also sometimes called Crimini mushrooms. 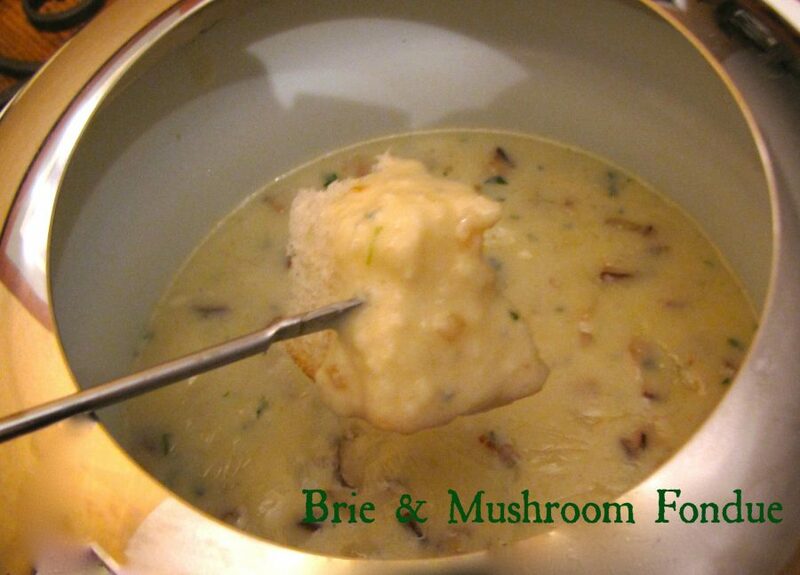 They have a bit more flavor than regular mushrooms and are easy to find now in most grocery stores. However, if you only have regular button mushrooms, they will be fine too. 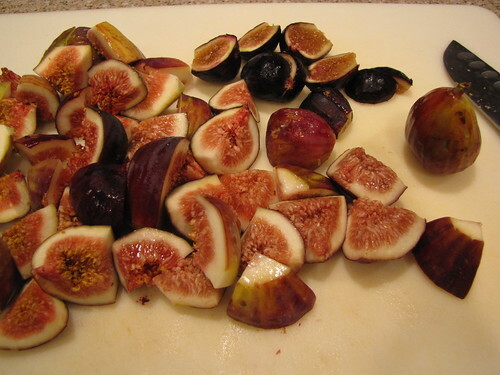 Rinse the figs and prepare them by cutting off the top stem and cutting them in half if they are small like the Mission Figs or quarters if they are larger like the Turkish Brown figs. If you’ve never had fresh figs before, give one a try raw. The inside is a little sandy like a Fig Newton cookie…slightly sweet but not an overwhelming flavor. 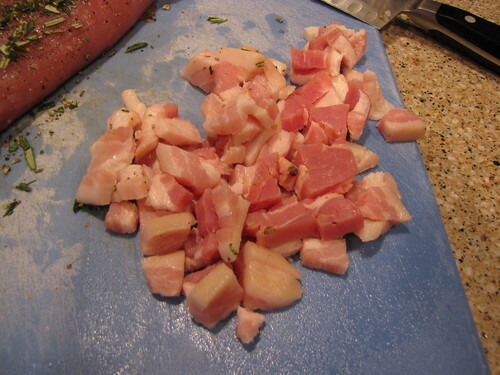 Speaking of flavor, to add some, chop up 1/4 pound of pancetta into small cubes. Pancetta is basically Italian bacon that has been cured (usually with peppercorns added) but not smoked. I buy mine at the deli counter of the regular old grocery store. Ask your deli slicing professional for 2 slices of pancetta, each about 1/2 inch thick. By now your meat has had a chance to shake off the cold from the refrigerator and marinate in the rosemary and olive oil. Hopefully your grill or broiler is hot too. Oil the grill and place the meat over a medium high heat. If you don’t have access to an outdoor grill, you can still cook delicious pork on a grill pan or under the broiler in your oven. If you’re using the broiler, put the meat on a middle rack so it’s not too close to the flame or heating element. 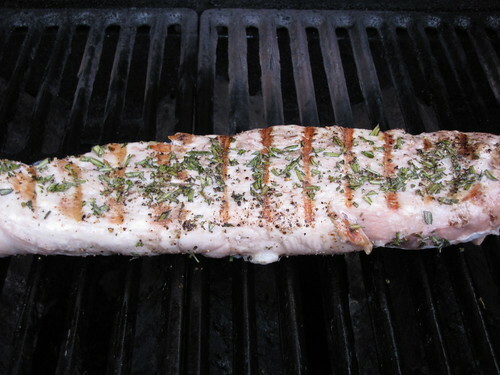 Grill or broil for about 15 – 20 minutes, turning occasionally to brown all of the sides of the tenderloin. While the pork cooks, it’s time to make the fig sauce. Melt 1 Tablespoon Butter and 1 Tablespoon Olive Oil in a large pan. 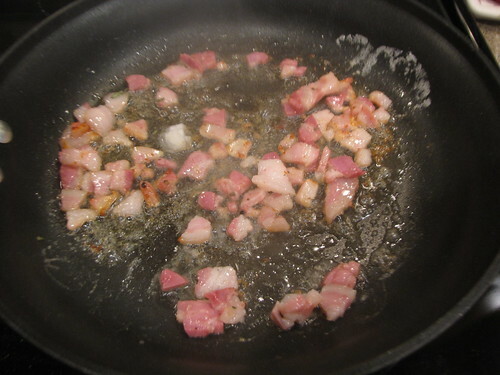 When the butter is foamy, add the pancetta and cook over medium high heat until the fat renders and the pancetta becomes golden brown but not crispy. This usually takes about 3 – 5 minutes. Next add the onions and the sliced mushrooms and cook until golden, soft, and the mushrooms have given off most of their liquid. This takes about another 3 – 5 minutes. Remember to go check in on the pork and turn it to brown another side. 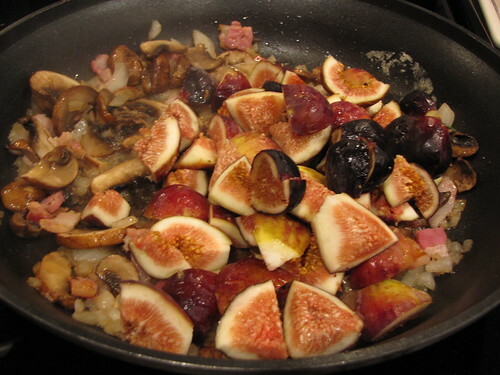 After the mushrooms and onions have cooked in the pancetta, add the quartered figs. Cook the figs for 2 -3 minutes just until they start to soften. Fresh figs are pretty soft to begin with so we don’t want to overcook them or they will totally fall apart. 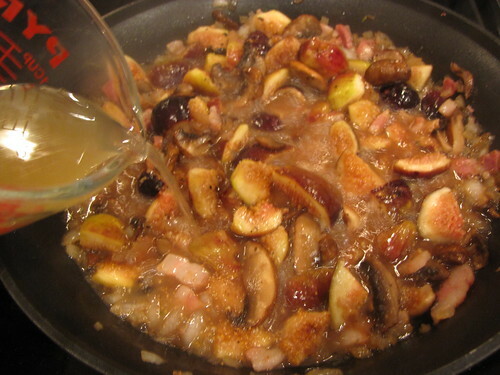 Add 3/4 cup of Marsala wine and gently scrape up any browned bits from the bottom of the pan. Marsala is a “fortified” wine often used in Italian cooking and sauces. I even put Marsala in my gravy for Thanksgiving. You can find it in the store or wine shop near the other fortified wines such as Sherry and Port. A quick note: if you’ve purchased Marsala wine for this dish, you now have a really good excuse and the key ingredient to make Chicken Marsala sometime soon. 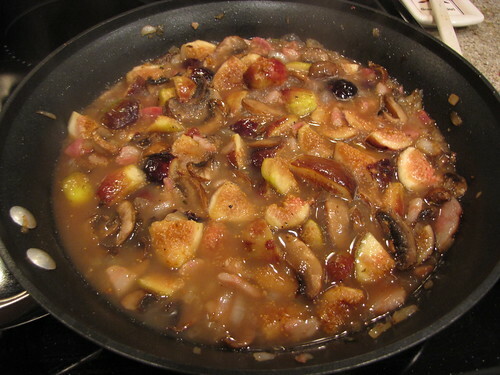 Cook the figs, simmering the sauce over medium heat until the wine has been reduced by half then add 1/3 cup of chicken broth. Season with salt & pepper. 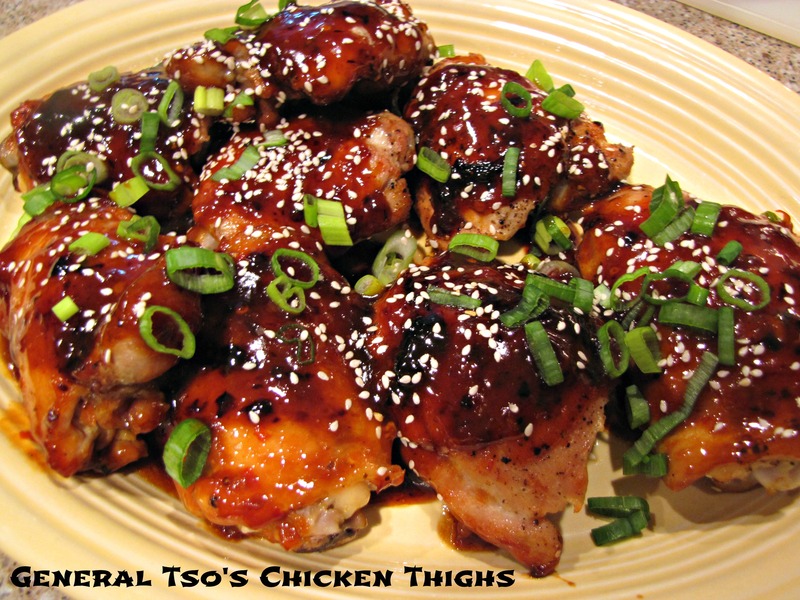 At this point, if you need to hold the sauce to wait on the pork to finish cooking or to rest, simply turn the heat down to it’s lowest setting or set the pan off the stove. 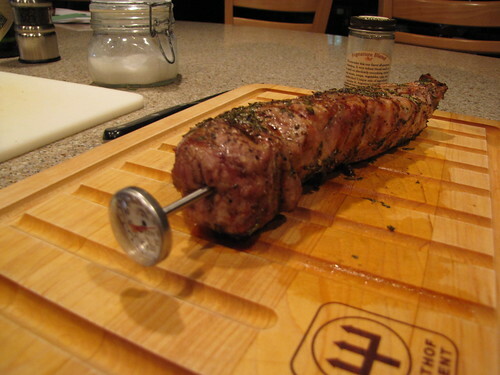 Check in on the pork and take it’s temperature with an instant read thermometer. We want an inner temperature of 160 degrees. Notice that I’ve stuck the thermometer in through the end of the tenderloin, longways into the meat. This gives you a more accurate reading from an inner section of the pork. Cover with foil and allow the pork to rest for 5 – 10 minutes so that the juices can go back into the meat. 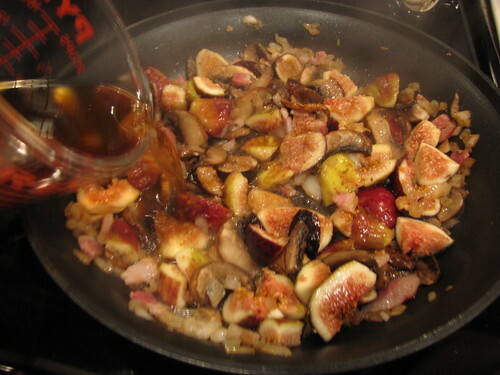 After the pork has rested, bring your fig sauce back up to a simmer if it has been sitting off the heat. Cook the sauce for 2 -3 more minutes to thicken slightly. I like to serve this by scooping the figs, mushrooms and pancetta onto a platter. 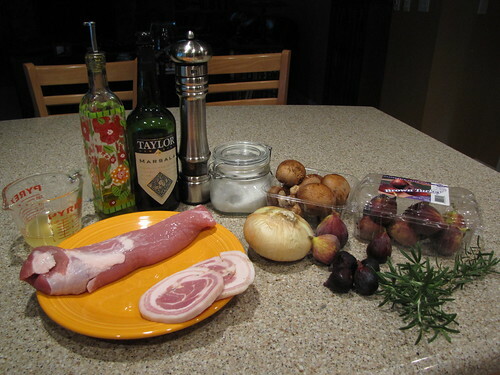 Slice the pork, arrange it over the figs and spoon a little of the juicy sauce over the pork. I served this with a side of Rice Pilaf to catch all that good sauce. Some crusty french bread would be a nice addition too. 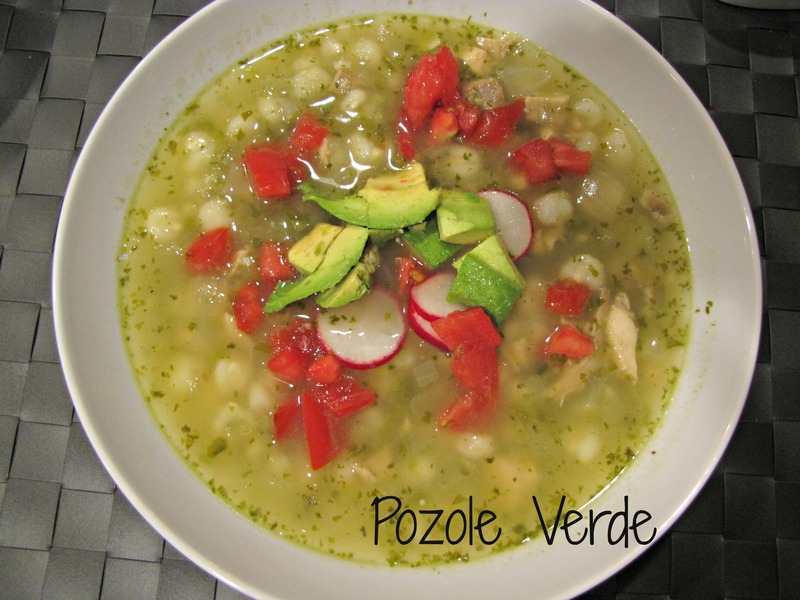 Add a green veg or a salad and you’ve got a great dinner. 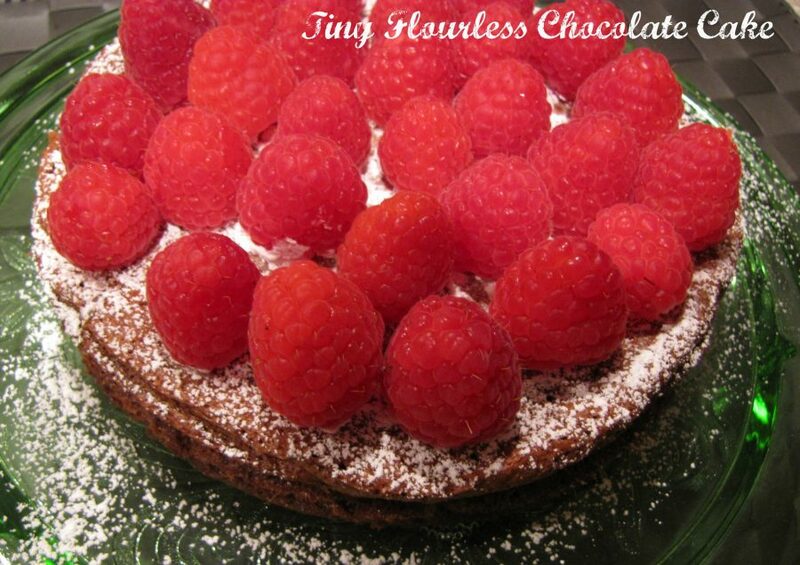 I love this dish. Jim loved it too….so much that he even tried to take all of the leftovers for himself. Figs. They’re not just for Newtons anymore! P.S. Have an idea for an Idiot’s Kitchen Secret Ingredient? Leave a comment here or over on the Facebook page!